Clean cabin. Complete pantry for light cooking. Location near to bus stop 244 for going to paris centre. And change with metro train. Free parking. The market and restaurant on site were super convenient. And my kids loved the playground. The staff was really nice. The supermarket on site is convenient. There's also several supermarkets/restaurants just 10/15 minutes away by foot. If you come for some activity in the Longchamp racetrack then the location is ideal. There's a 2€ shuttle to get you to the nearest metro station otherwise. The camping itself was nice and quiet. Seemed to be a good place for bigger families I suppose. Receptionists were very polite and tried to help us as much as possible (we don’t speak much French). The trailer we stayed in was a 2 bedroom, it was very spacious perfect for a family of 5. Location is great if you have kids as there is a playground to keep them entertained. Supermarket and restaurant were very convenient! Great location, the shuttle to the metro gets you quick access to the Paris metro. Great space for the kids to play after a day in the city. The location is great for travelling on bus or bus taxi. It's close enough to sites that a taxi is reasonable. The location was good in a quite place which meet my requirements. And it was a safe stay. I liked that it was a private and homey experience to stay at a camper. 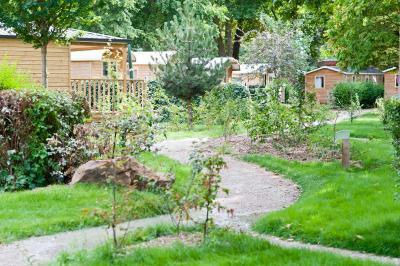 Camping de Paris is located on a 7-hectare park in Paris, on the banks of the River Seine beside the Bois de Boulogne. 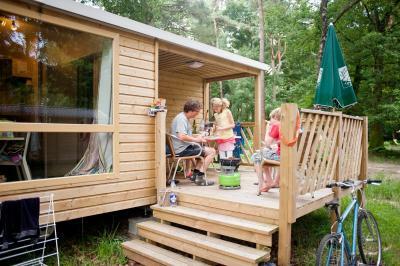 It offers wooden caravans and cottages with a covered furnished terrace. Each cottage and caravan at Camping de Paris has a fully equipped kitchen, a TV and a private bathroom. They offer views over the park and the river Seine. The restaurant and the bar are open for breakfast and dinner. The campground also has its own grocery store on site which is open every day offering you fresh french pastries. A shared lounge with billiard table, table football, TV, large choice of books and free WiFi is always available to guests. The front desk offers a free internet service and computers for guests' use. Additional facilities include free private parking, a children’s playground and bicycle rental during the summer months. Longchamp Racecourse is 0.6 mi away. A private shuttle can take guests to and from Porte Maillot Metro Station 2.5 mi away, which gives direct access to La Defense, Châtelet and the Champs Elysées. The property is located 25 minutes by car from Paris Expo - Porte de Versailles Convention Center while Espace Champeret Convention Center is 20 minutes away. 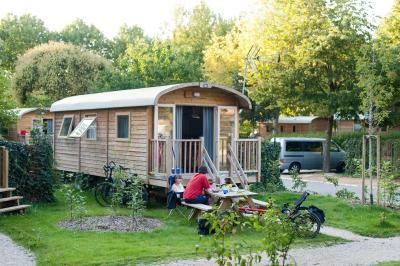 When would you like to stay at Camping de Paris? This caravan has a private terrace overlooking the garden, a sitting area and a kitchen. This mobile home has a private, covered terrace with furniture overlooking the garden, and a kitchen. This mobile home has an equipped kitchenette, a private bathroom and a direct access to a patio. This mobile home features a private entrance, kitchenware and dining area. Area Info – This neighborhood is a great choice for travelers interested in shopping, romance and restaurants – Check location Good location – show map Guests loved walking around the neighborhood! House Rules Camping de Paris takes special requests – add in the next step! Camping de Paris accepts these cards and reserves the right to temporarily hold an amount prior to arrival. Please note that a EUR 90 to EUR 200 damages deposit will be required upon arrival. This may be used to charge for any damages incurred to the accommodations during your stay. Please note that the bar and restaurant are open for breakfast and dinner until 22.00. The supermarket is open daily. Please note the caravans cannot accommodate baby cots. Please note that the automatic fence closes from 01.00 to 06.00. Difficult for us to move frm lobby to cabin. Supposdly should provide trnsport. The couch bed in cabin 7 was terrible. If you are going to rent a cabin for 6/5 people then you need to have a good mattress for the extra bed. There was no tea towel to dry the dishes and we were told to use the bath towels (by a boy in reception). Thete was no plug for the sink. The chicken burger and steak meals at the restaurant were terrible, but the pizzas were ok. The location and shuttle bus were great. The towels were not cleaned nor it was new,some of them were strained and not cleaned properly. We were told in the reception that there is no wifi facility available ,however on the day of departure we noticed a display informing about the free Wi-Fi facility which can be used in the rooms... And when we wanted to return the unused new shuttle tickets they were not taken back which is not fair. There is no proper facility for charge point and one has to really search a lot to find a plug point. The location and Shuttle bus was good. Good staff.. small store selling all needs. Nice environment.. cooking facilities in the chalet. WiFi was problematic, often having to log on multiple times a day. Signal strength very weak during peak times. Laundry facilities could do with an update. Amazing location. Beautiful spot, close to Paris and on the river. The establishment was clean and as promised. The only problem is that it is located out of the city. The bed confort was better than some hotels it was warm and cosy. The location very practical. The receptionist very friendly. Didn’t have a kettle, just a coffee machine. Clean and tidy, good amount of space. Being British we are use to different type of breakfast however loved the fresh orange juice. great place to stay, Very clean , small but very cosy. Great and easy transport, taking bus then train to everywhere. We enjoyed and will be back again. there was poor internet access, it is said that there is a free wifi available entire area. but it was a lie. asked the girl if she can improve it, she said that she had nothing to do with it. also, breakfast per person was very expensive. even for our 2 and 4 years old kids. The bed linen could do with being looked at as the under sheet had a couple of holes in it. The restaurant could do with stopping open till the time it states as it shut early both nights we were there.